Prime Minister Narendra Modi’s ambitious project for a High Speed Rail for Mumbai-Ahmedabad section finally picking up pace. To Check India’s First High Speed Rail Live Updates, please scroll down. 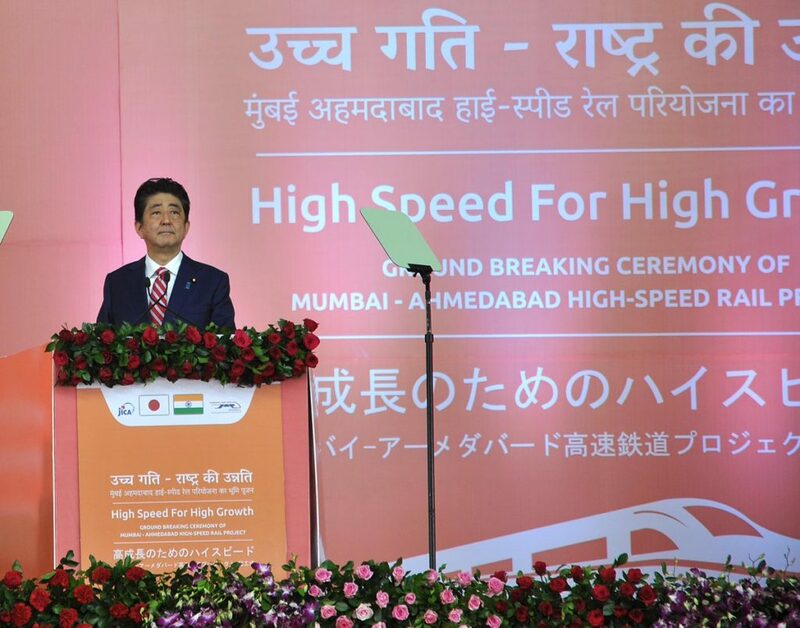 Prime Minister Narendra Modi along with his Japanese counterpart Mr.Shinzo Abe, Prime Minister of Japan will lay the foundation stone for the Mumbai-Ahmedabad High Speed Rail project on September 14 in Ahmedabad. 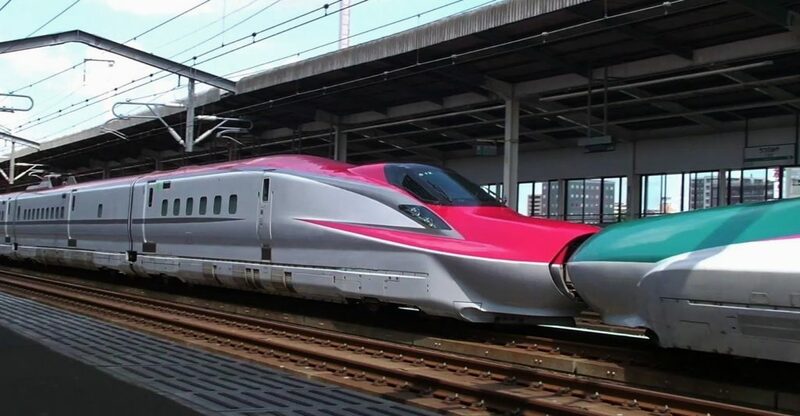 Japan Railways has appointed Mr. Sanjeev Sinha as Advisor for the Rs 98000 Crores High Speed Rail project. Get India’s First High Speed Rail Live Updates with Rail Analysis, please scroll down for more information. Prime Minister of India Sh. 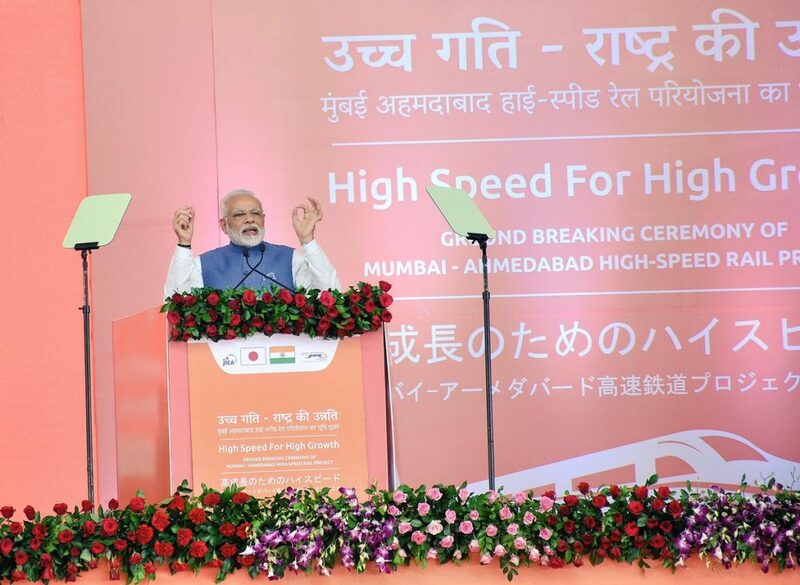 Narendra Modi and Japan’s Prime Minister Mr. Shinzo Abe will visit the Sabarmati station in Ahmedabad on Sep 14 and lay the foundation stone of Mumbai – Ahmedabad High Speed Rail corridor. 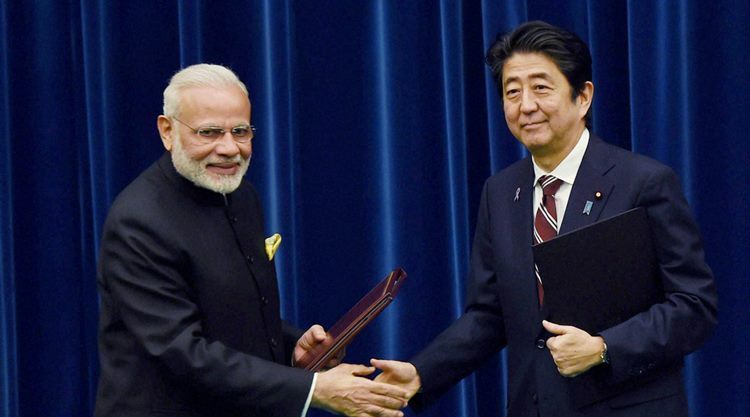 Japanese Prime Minister is Shinzo Abe is coming to India on Sep 13th for a 3 day visit and is expected to sign as many as 10 memorandum of understandings. Rail Analysis India Team has conducted a survey, a week ago for taking suggestions of the people on India’s First High Speed Rail Project from Mumbai-Ahmedabad. Rail Analysis India Team: The Japanese PM is going to Kick off India’s First Bullet Train Project in September, What are your opinions for the same? Madhu Sudanan : It is a welcome initiative. Atul Pati Tripathi (A7 Innovations) : It is good to have high speed train services but we need to focus on existing railway infrastructure to maintain safety and security standards. Virendra Kothari (Alstom Transport) : It’s overall commercially feasible project which will bring India into the international HSR map. Julian Bond (Bond5 Associates Ltd) : Technically India is ready, whether the security and land clearance is possible within the time frame is to be seen. Suhas Ambekar (DONGRE PMCPL) : It is a good omen for the restructuring and redeveloping the Indian Infrastructure establishment, which is the vision of our government. High speed trains will not only reduce the time of travel but also will be effective in smoothly connecting the cities for mutual developments. S R M Service : Very welcome step. The happiness is such that a dream is coming true. However, mere laying of foundation stone will not help in make the dream happen. There should be a strict time bound completion mechanism of the project i.e. by 2023, even before that. For that a strict monitoring of the project observer or efficient person like E Sreedharan’s has to be called for or any other engineer of his calibre and endorsed by him so that no corruption happens and the project is completed in time or well before time. Otherwise as it is in the past eras of delayed project resulting into cost escalation and giving way for self proclaimed intellectuals who are against of such development in our country to criticize. Stefan Graf (Amberg) : Great that India starts to get experience in that HS technology and the corresponding way to engineer, construct and maintain it. 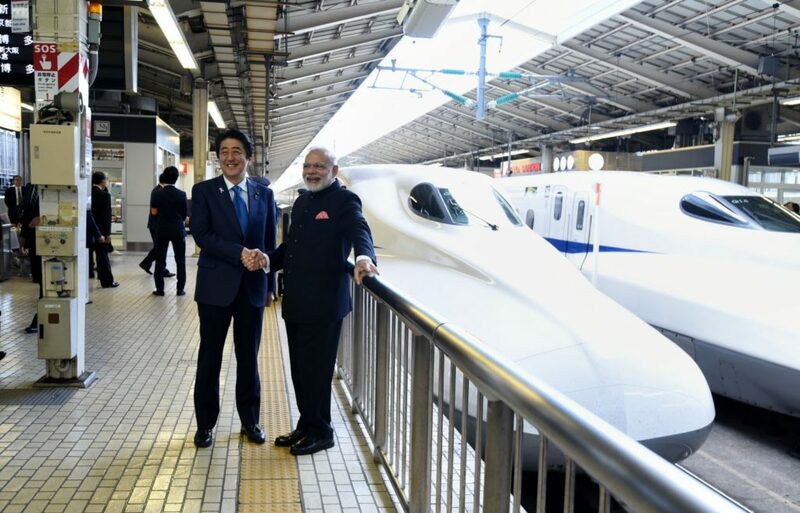 Rail Analysis India Team: As India has contracted with Japan for E5 series Shinkansen Bullet train, so what do you think are the facilities to be there in the Bullet Train for passengers? Madhu Sudanan : Individual mobile/Laptop charging points, Wifi on train, Individual entertainment screens with head phone jacks. Atul Pati Tripathi (A7 Innovations) : The new generation E5 series trains are designed to be more comfortable and faster than ever before. It is designed to be a business and luxury car service. It comes with a premium first class seating area, called GranClass. Virendra Kothari (Alstom Transport) : All current on board technologies including highest level of safety. Julian Bond (Bond5 Associates Ltd) : Certainly 1st and 2nd class seating, buffet car, depending upon travel time, toilets in each coach, info’ screen as well as Internet availability. Suhas Ambekar (DONGRE PMCPL) : Comfortable seating with proper leg spaces, decent, neat and clean toilets, proper and comfortable access and seating for elderly and differently-abled persons, effective and smooth free Wi-Fi and internet facilities, on-seat entertainment facilities, on board medical facilities etc. to list a few. 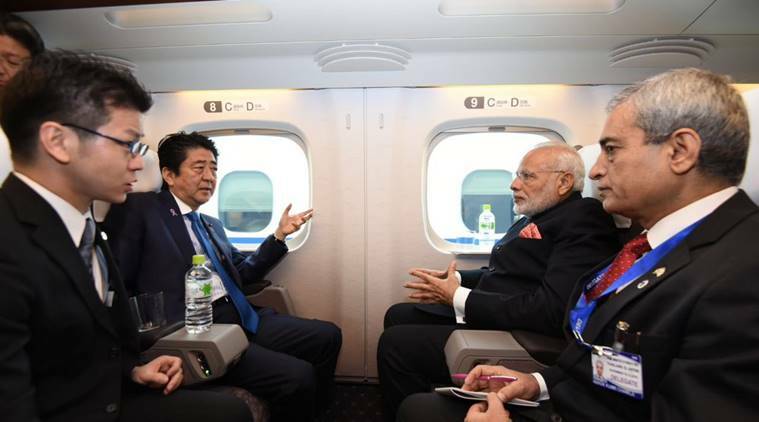 S R M (Service) : As per my knowledge, the Japanese version of E5 may are manufactured without LED TVs behind each seat of chair/executive class, so the concept of LED panel along with music system may also be added. Initially if it is difficult then too much time should not be wasted, the existing version can be introduced initially and subsequently more changes can be bought. Since the train manufactured by Shinkansen/Toshiba is already equipment with latest equipment’s’ so too much modifications may not be required immediately. Phanikumar P (Alstom) : This project will be realised only after 2030 based on need. So we will think at time of realisation based on need. Rail Analysis India Team: What according to you are the key areas on which government have to focus while implementing the project? Madhu Sudanan : 24 hrs Secured track free of any encroachments from human or animals for train. It is better if train runs in a cage or tunnel. Atul Pati Tripathi (A7 Innovations) : Improvement on existing railway services and strict safety measures. Julian Bond (Bond5 Associates Ltd) : Power and security to allow the project to function. Training for staff to a higher level. Technical knowledge and a high level of maintenance and investment. Suhas Ambekar (DONGRE PMCPL) : Safety first always. Proper and well conditioned platforms, waiting areas and rooms. Decent and proper displays for coach numbers and arrival-departure timings along with latest information etc. No-noisy announcement system. Smooth transfer and transportation facilities between Road, Railway, and other infrastructure facilities. Separate internet reservation (like IRCTC) with on platform kiosks and counters for easy booking. S R M Service : First and the foremost part of the any technical project of this nature is that time bound completion. Only people with technical background and especially with Railway Engineering service personally should be employed and technical person with Rail technology like the esteemed Shri E Sreedharan should only be the main implementing as well as commissioning authority. The room for red-tapism/beurocratism should never be allowed. Vladimir Finov (RZD International LLC) : Implement it within the planned timeframe and within the budget. Phanikumar P (Alstom) : Network upgrafatio and awareness to passengers. Sanjeev Sharma (Egis Rail) : Solid planning and strong emphasis on implementation. Reduction in red tape. Rail Analysis India Team: What could be the other corridors for Bullet Trains in India, according to you? Julian Bond (Bond5 Associates Ltd) : Using the freight corridor as a conduit, connect the 4/5 major centres of commerce and industry. Suhas Ambekar (DONGRE PMCPL) : Delhi-Ahmedabad, Jamnagar-Ahmedabad, Delhi-Udaipur, Hyderbad-Bangalore, Bangalore-Chennai, Delhi-Amritsar, Indore-Vadodara/Ahmedabad, Bhopal-Delhi, Nagpur-Mumbai, Mumbai-Chennai etc. S R M Service : In India almost every young generation wants the uniqueness in the technological marvel in Railways by introducing Swanky High Speed Bullet Trains. So in every region, the young generations are of the view of immediately having such type of Bullet Trains. Recently in a report in the paper “The Hindu”, after having a survey of people who wants Bullet train in Kerala conducted by the State Govt., to the surprise of State Govt. majority of people i.e. 83% of people from the survey wanted implementation of such project without any delay. So this is the change happening in our country. The people have high expectation from present central Govt. headed by dynamic leader Shri Modi and his team can only do and have guts to implement such projects and complete it on time. The E5 Shinkansen series bullet trains to be pressed into service on the upcoming Mumbai-Ahmedabad high speed corridor. Indian Railways passengers can look forward to entirely new features. 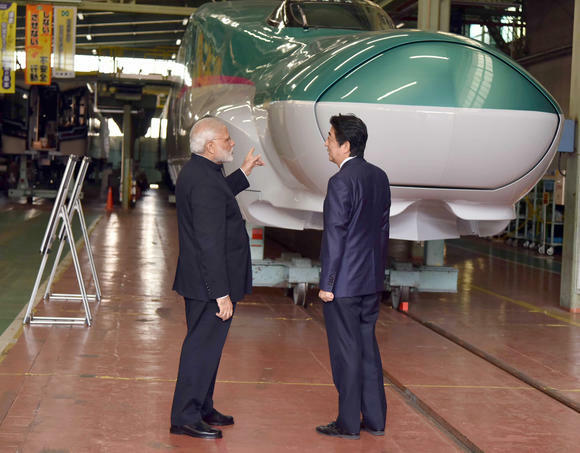 Japanese E5 Series Shinkansen trainsets will be purchased, with technology transfer to support the “Make in India” policy of government of India. Car Body Made up of : Aluminum alloy. 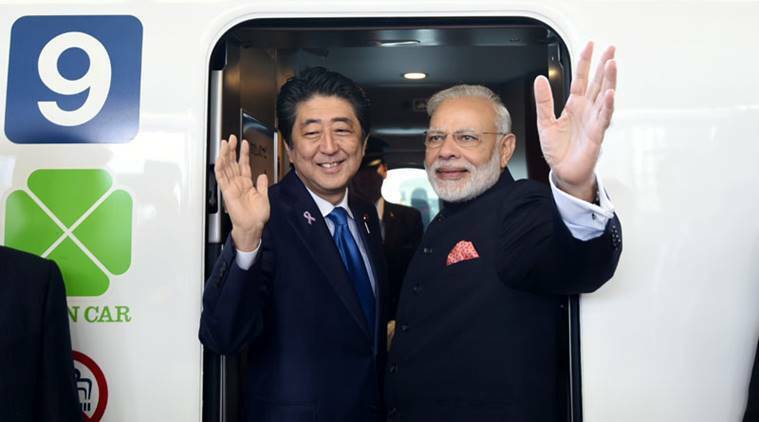 Japanese Prime Minister Mr. Shinzo Abe’s Gujarat Visit And India’s First High Speed Rail Foundation Stone Laying Ceremony, Get all the live updates. 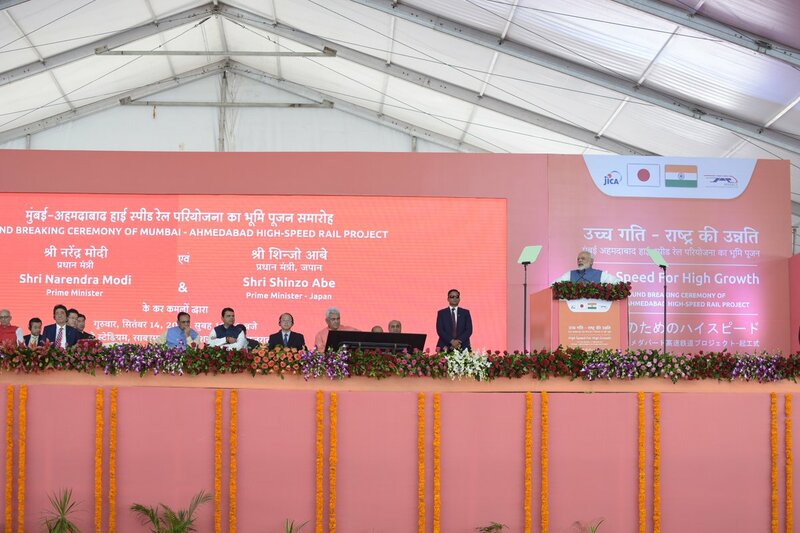 PM Narendra Modi along with japanese PM Shinzo Abe addresses the gathering at the function of Mumbai-Ahmedabad High Speed Rail Project in Ahmedabad. September 14, 2017 [11:06 AM] : Our railway network is so huge that number of people travelling in trains every week in India is equal to Japan’s total population says PM Narendra Modi. September 14, 2017 [10:52 AM] : This project will benefit many people including railways, manufacturers, commuters etc. 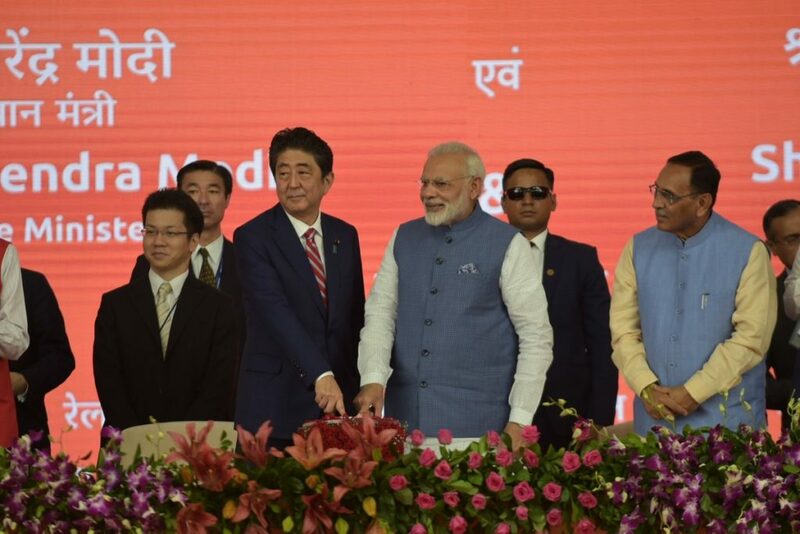 September 14, 2017 [10:16 AM] : PM Narendra Modi and Japan PM Shinzo Abe lay foundation stone for India’s first High Speed Rail project. September 14, 2017 [10:05 AM] : Fadnavis says we are not only laying the foundation stone of bullet train, but also laying foundation of ‘New India’. September 14, 2017 [10:02 AM] : Maharashtra Cheif Minister Devendra Fadnavis today thanked Japannese PM Shinzo Abe for extending help in India’s first bullet train project. September 14, 2017 [09:59 AM] : This Bullet Train will be a symbol of brotherhood between people of India & Japan, says Railway Minister Piyush Goyal. 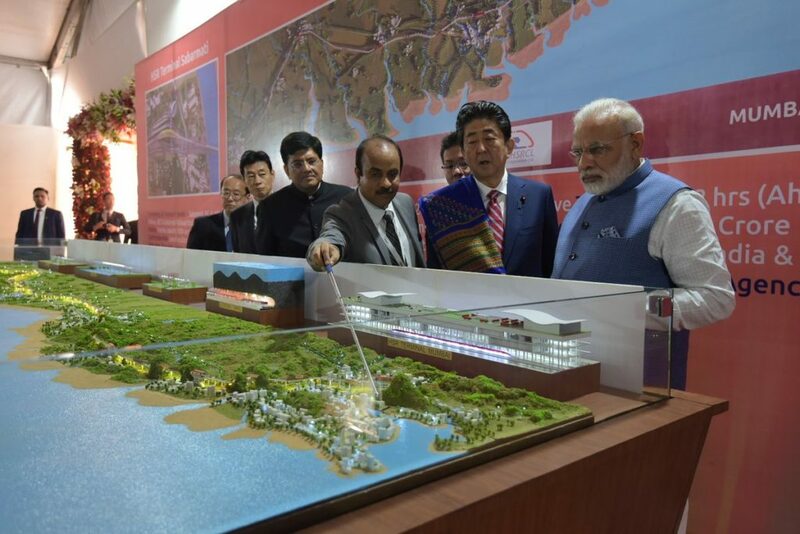 September 14, 2017 [09:54 AM] : PM Modi and Japanese PM Shinzo Abe inspect a model of the high speed rail from Mumbai to Ahmedabad. September 14, 2017 [09:50 AM] : PM Modi & arrive at stage for inauguration. September 13, 2017 [04:59 PM] : A special Gujarati platter has been prepared for Japanese PM Shinzo Abe. September 13, 2017 [04:57 PM] : PM Modi, Japanese Shinzo Abe will have their dinner at Agashiye terrace restaurant, which is known for its splendid view and kosher Gujarati cuisine. 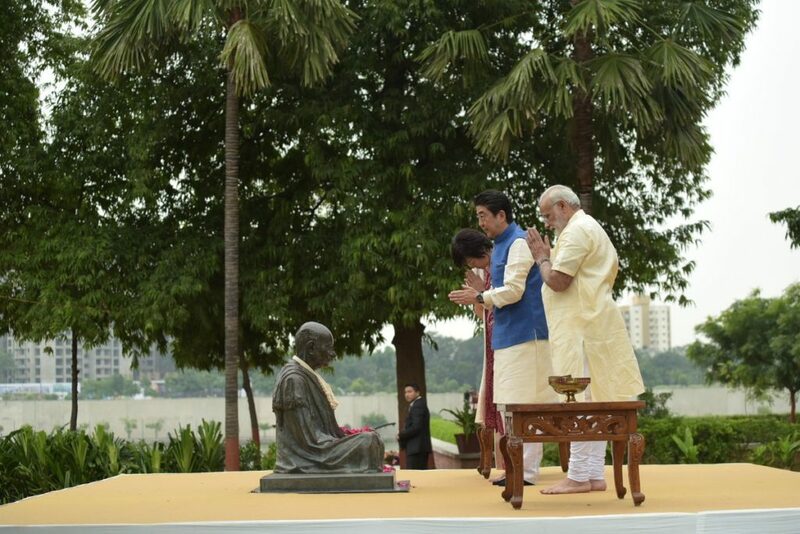 September 13, 2017 [04:48 PM] : PM Narendra Modi and Japanese PM Shinzo Abe and his wife Akie Abe pay tribute to Mahatma Gandhi statue at Sabarmati Ashram. September 13, 2017 [04:25 PM] : Public cheers as PM Modi & Shinzo Abe head towards Sabarmati Ashram in Ahmedabad. September 13, 2017 [04:10 PM] : PM Modi and Abe begins roadshow in Ahmedabad. September 13, 2017 [03:55 PM] : Japanese PM Shinzo Abe and PM Narendra Modi’s has left the airport. September 13, 2017 [03:46 PM] : Japanese Prime Minister accorded Guard of Honour at the Airport. September 13, 2017 [03:43 PM] : Shinzo Abe, accompanied by his wife, is being welcomed by PM Modi. September 13, 2017 [03:40 PM] : Shinzo Abe received by PM Modi at the airport. 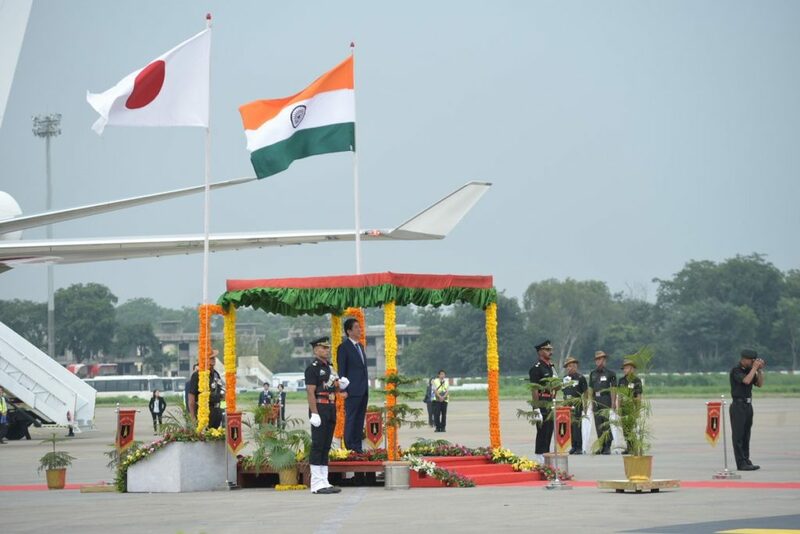 September 13, 2017 [03:30 PM] : Japanese Prime Minister Shinzo Abe’s plane lands at Ahmedabad. September 13, 2017 [03:25 PM] : The first formal interaction between the PM Modi and Abe leaders will take place at the Sabarmati Ashram. September 13, 2017 [03:20 PM] : The two world leaders will embark on an 8-km-long road show. 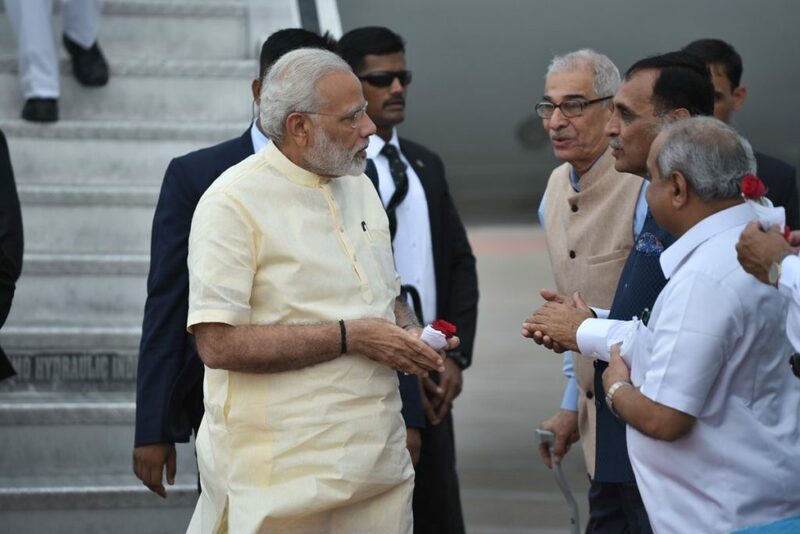 September 13, 2017 [03:15 PM] : PM Modi is currently at airport. September 13, 2017 [01:40 PM] : 9,000 cops have been deployed across Ahmedabad ahead of the PM Modi and Japanese PM Shinzo Abe visit. September 13, 2017 [10:25 AM] : PM Modi will host dinner for his japanese counterpart Shinzo Abe at a hotel in the old city area. September 13, 2017 [10:15 AM] : Sidi Saiyyed Mosque gettting ready for PM Modi and Abe visit. September 13, 2017 [10:05 AM] : PM Modi will be present through the road show with his japanese counterpart Shinzo Abe. 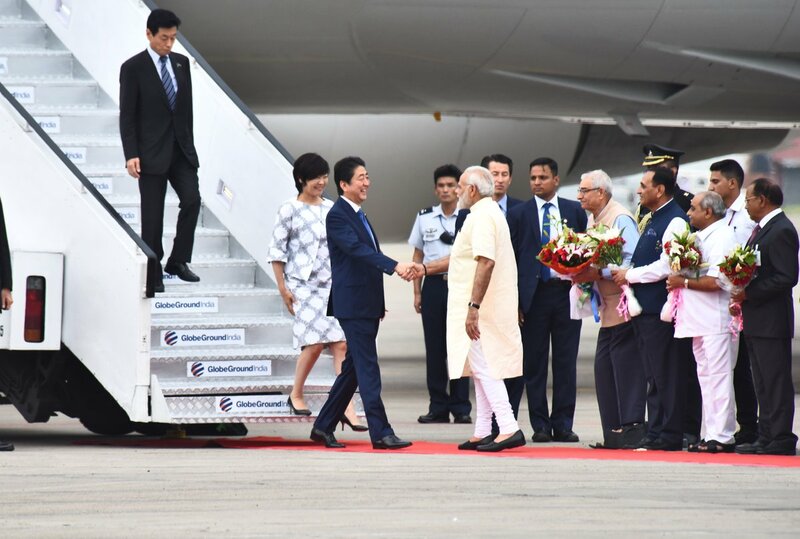 September 13, 2017 [10:00 AM] : Prime Minister Narendra Modi will welcome his Japanese counterpart personally at the Ahmedabad airport. September 13, 2017 [09:55 AM] : Strong and affective security arrangements have been put in place for the 12th Indo-Japan Summit. 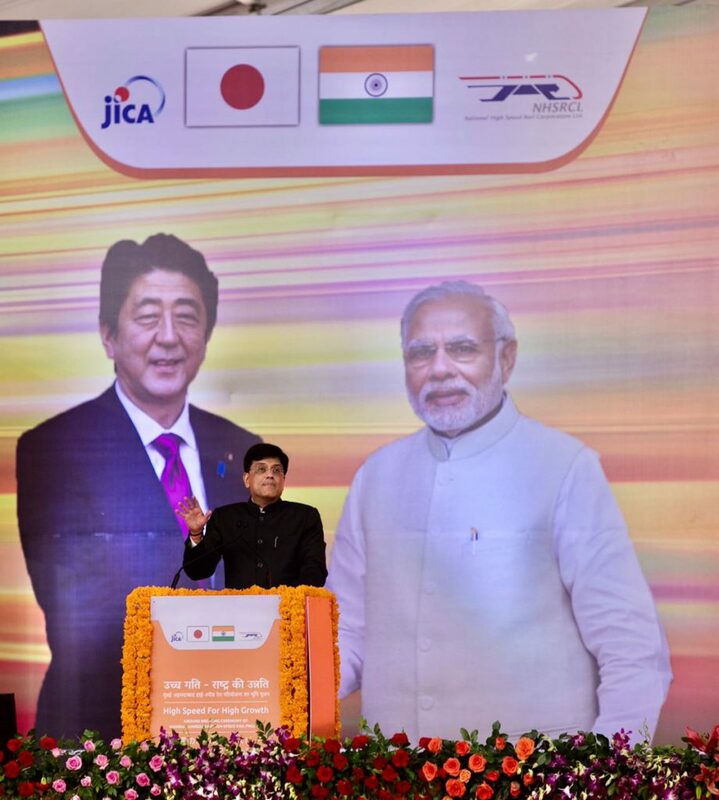 September 13, 2017 [09:40 AM] : 15 companies from Japan are keen to invest in Gujarat and likely to be signing agreements with the State government during – the 12th Indo-Japanese annual summit on Thursday. September 13, 2017 [09:36 AM] : Japanese PM will be given an overview of the heritage of the city (Ahmedabad) in Prime Minister Modi’s home state. 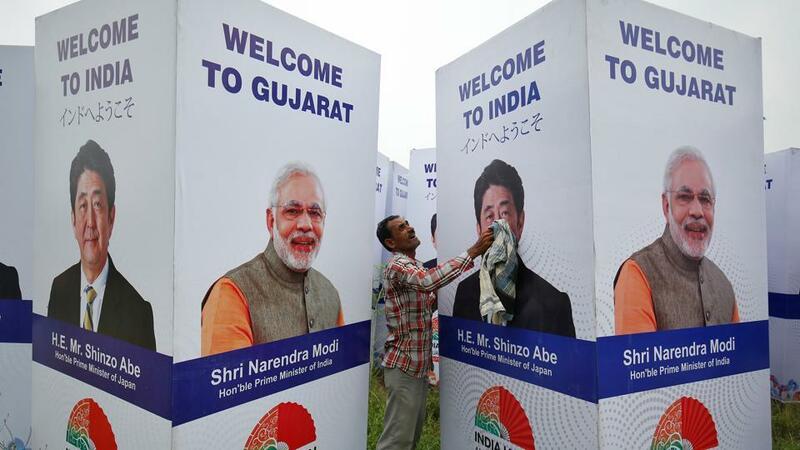 September 13, 2017 [09:35 AM] : Ahmedabad & Gandhinagar are all decked up, with streets dotted with hoardings and banners of Abe. 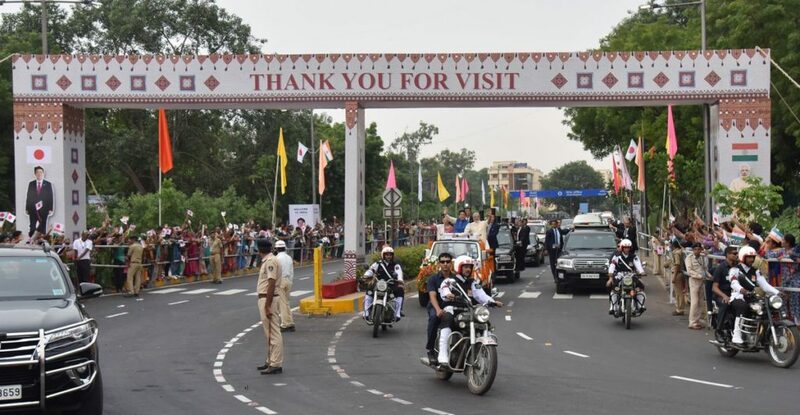 The visit will begin today afternoon with an 8 km road show where Japanese PM will be accorded a grand welcome. 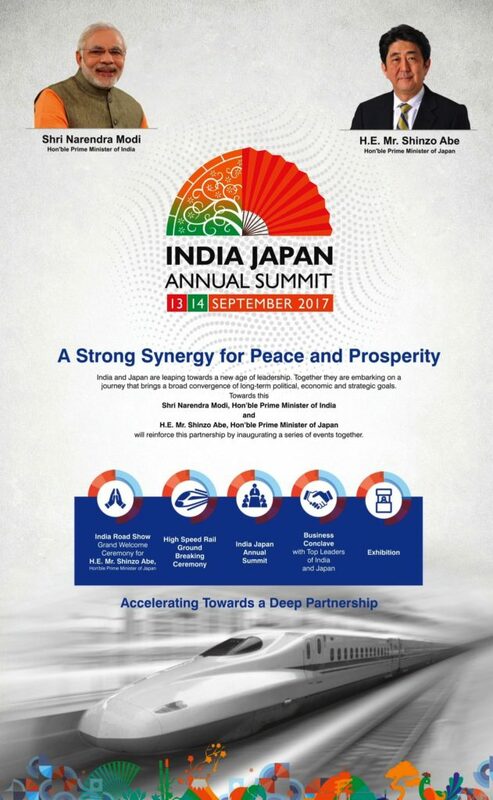 PM Modi will also be present through the road show with Abe. Leave Your Comments Below, If you want anything more in the High Speed Rail Live Updates. We will try out best to provide you the information ! 8 Comments on "PM Modi and Japanese PM Abe lay foundation stone for India’s first High Speed Rail project – CHECK LIVE UPDATES"
Well Compiled , India’s HSR Project is eagerly awaited ! Great information… I hope work on other HSR corridor will start soon. Nice Information Rail Analysis, keep it up! I also want to take this survey what you have conducted. please provide me a link for it. Thankyou for your kind consideration.